This is a transcription for three guitars of Georg Friedrich Handel’s Water Music, Suite # 2 in D major, originally written for winds, horns and strings. The Water Music is one of Handel’s most celebrated compositions. It premiered on July 17, 1717 and was composed at the request of King George I. The concert is said to have been performed by fifty musicians playing on a barge on the River Themes. The King and his party listened from the royal barge and the entire group traveled on the Themes from London to Chelsea or Lambeth. Some accounts record that the King so enjoyed the music he asked that the entire concert be repeated three times.This edition is designed for concert performance as well as for classroom instruction. The score is presented with amply notated guitar fingerings for each of the three parts. Also included are separate parts for each of the guitars. 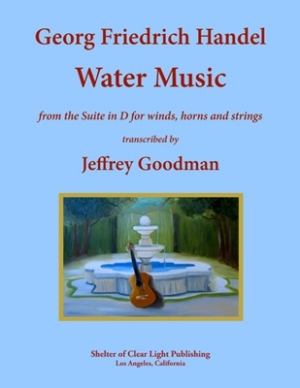 This is a transcription by Jeffrey Goodman for three guitars of Georg Friedrich Handel's Water Music, Suite # 2 in D major, originally written for winds, horns and strings. The Hornpipe is one of the most famous and beloved of the pieces included in the Suite, and can be heard today in many versions. This is a transcription for three guitars of Georg Friedrich Handel's Water Music, Suite # 2 in D major, originally written for winds, horns and strings. The Water Music is one of Handel's most celebrated compositions. It premiered on July 17, 1717 and was composed at the request of King George I.